63 percent of all sports fans are interested in paying for an OTT service. But making sense of the increasingly crowded OTT sports landscape can be a challenge. 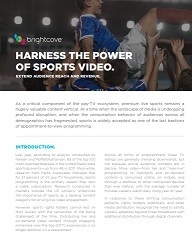 Fuel your sports video offering with this definitive playbook from Brightcove and SportsPro. Take a deep dive into the most compelling innovations in sports video and learn more about the best-in-class products and experiences from established providers and disruptors alike, all to engage, excite, and monetise audiences. ← New Welcome Offer, Acca Boosts, And Profit This Weekend!